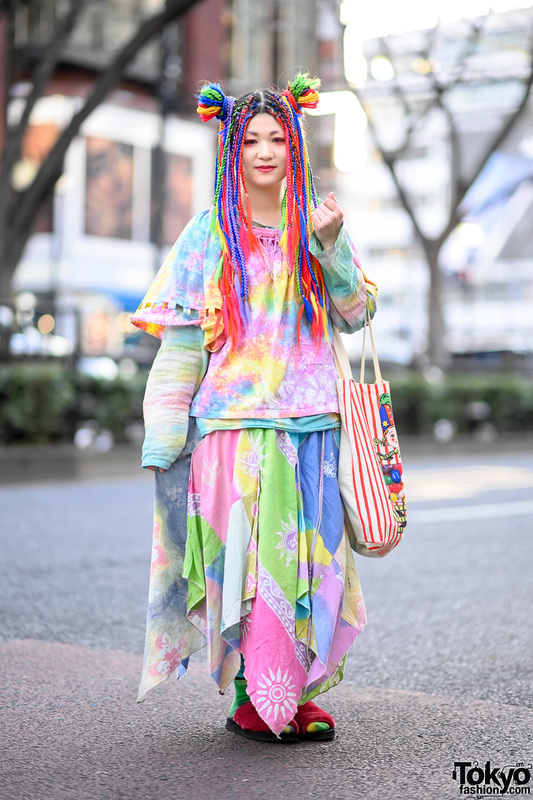 This fashion-forward girl is Ruka, a 17-year-old student. She’s wearing a blue zippered top from Barrack Room (her favorite fashion source) over a rust-colored satin cami. Her jacket features wide lapels and a mix of fabrics. Her asymmetrical skirt is a remake. She’s also wearing eye-catching cutout tights and rocking horse shoes from Tokyo Bopper. If you read Japanese, you can follow Ruku’s tweets on Twitter. Not very fond of her outfit… but her face… wow! She’s beautiful. I like this whole look. The pieces are unexpected. Love the skirt and tights! The best design yet… the colors just bump off of each other and cause a Kaleidoscope of expression. Just beautiful!